SCOTTSDALE, Ariz. — Responding to consumers’ rapidly changing needs is a top priority for the National Association of Chain Drug Stores, Walgreens Boots Alliance Inc. co-chief executive officer Alex Gourlay said in his inaugural remarks as the organization’s new chairman. “The theme for today, and moving forward, is the customer — understanding the customer’s needs and meeting them,” Gourlay said at the 2017 NACDS Annual Meeting here last month. Gourlay detailed some of the big shifts that are affecting the chain drug industry, including demographics, fulfillment, shopping behavior, wellness and ­personalization. 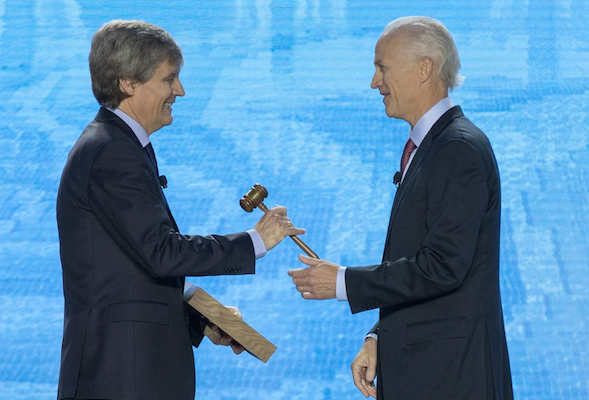 WBA’s Alex Gourlay accepts the NACDS chairman’s gavel from H-E-B’s Martin Otto at the Annual Meeting. The growing consumer interest in health care, and in being proactive in taking care of themselves, represents another big change, and a big opportunity. Gourlay, who noted that he spent more than half of his 40-year career in the industry as a pharmacist and a store manager, said he believes NACDS and chain drug retailers are well positioned to make a real and positive difference in people’s lives. Gourlay, together with outgoing NACDS chairman Martin Otto and association president and chief executive officer Steve Anderson, emphasized the need for improvements in America’s health care system. “We’ve got costs that are too high, quality that doesn’t measure up to what we’d like it to be, and access issues for Americans that aren’t at the level that we’d hope they would be,” said Otto, who is chief merchant and chief financial officer at H-E-B. Otto argued that NACDS has three main missions. One is to create a marketplace for retailers and suppliers, and the second is to advocate for pharmacists and patients. The third mission, which accounted for the bulk of Otto’s remarks, is to take the lead and participate in the development of solutions to problems with the current health care system. NACDS announced its Future Value Targeting Initiative as part of that mission. Anderson said that with the Future Value Targeting initiative NACDS will be building on its strengths as an association by taking on some of the qualities of a startup, or a think tank. • Working to bring together diverse collaborators — including think tanks, associations, government leaders, opinion leaders and other stakeholders — to create innovative health care, health and wellness, and well-being concepts. • Devoting increased attention to corporate social responsibility programs of NACDS chain and associate members. • Packaging new and emerging issues as part of the NACDS Access Agenda, which conveys the theme that just as pharmacies are highly accessible for patients nationwide, they also are accessible to policy makers for solutions with broad, bipartisan support. • The release of opinion research commissioned by NACDS and conducted by Morning Consult — which can be broken out by state and congressional district. The research shows the favorability and accessibility of pharmacy; the credibility of pharmacy on issues related to saving money on health care; the strong appreciation of the pharmacy benefit in federal programs; and the popularity of enhancing access to newer pharmacy ­services.